In every medium there are a handful of undisputed masters, people whose talent cannot be denied. When it comes to comic strips, one name that immediately comes to mind in that light is Chragrin Falls cartoonist Bill Watterson, creator of Calvin and Hobbes. The strip, about a mischievous six year old boy and his stuffed (or is he real?) tiger, began in November of 1985 and quickly became a huge hit. Watterson could have easily given in to the forces of crass commercialism, but he refused to license his characters for merchandising. And when he felt he had done all he could with the strip, Watterson walked away from it in December of 1995. Since then the artist has largely shunned the public eye, becoming to some degree the comic strip equivalent of J.D. Salinger, as well known for his reclusiveness as he is for his work. And yet, like Salinger, that work continues to inspire new generations of readers. Joel Schroeder's feature length documentary DEAR MR. WATTERSON doesn't bother trying to track the artist down; it has far too much love and respect for the man. Instead, it looks at the impact Watterson's work has had on both ordinary people who read and enjoyed it, and Watterson's fellow cartoonists. Among those offering their praise for Watterson are Berkley Breathed (Bloom County), Bill Amend (Foxtrot), Wiley Miller (Non Sequitur), and Jeff Mallett (Frazz), but it seems as if everyone (except for maybe Mort Walker) at least had great respect for the artist. It's obvious that director Joel Schroeder is a Watterson fan, and that's both good and bad for the film. 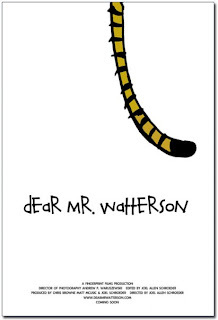 DEAR MR. WATTERSON is ultimately just a little too respectful. We do get a few interesting glimpses at early efforts by Watterson, including art for his high school paper, and a quick tour of Chagrin Falls, allowing us to see some of the real locations that were used as fodder for the stip, but not much of substance. One has to wonder if maybe there wasn't a way to dig a little deeper while still respecting the artist's wish to be left alone. Still, while it does feel a bit lightweight at times, the love this film has for its subject almost makes up for that. If you're a Calvin and Hobbes fan, you will most likely have questions you'll wish the film had addressed. But you'll also probably be inspired to break out the old strips and read them again, and there are certainly worse effects a movie can have on its audience than that. 3 out of 4 stars.